These days we carry around so much data that we like to share. Things like pictures, home video’s and even movies all in the palm off our hand on things like iPhones and digital camera’s. Till now it was difficult to show this because of the tiny screen’s that those devices have. 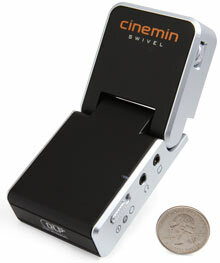 But now there is the Pico Projector from Cinemin. See the video below to see how this little projector can make you share you data the easy way. You see how much fun it can be to use this little projector. Now you can just see a movie on a wall or maybe the ceiling of your home. Or what about going camping and seeing a scary movie on your tent. HDMI is the new buzz word and with everything offering HDMI these days it start to become a bit difficult to connect. My HD TV only has 1 HDMI port so how do I suppose to connect all those HDMI devices? Right the IOGear HDMI Switch is the answer. It can connect up to 3 HDMI sources that you can easily switch between with the included remote. This is the solution for a lot of people like me that only have 1 HDMI port and all those video devices that ask for one. By reading this website you know that I don’t like to spend to much on the gadgets I get. And although I am very happy with my iPhone and iPod’s I never could get myself to spend almost 50 dollars for the Apple cable to get my video’s from my device to the TV. But then I found this AV cable at budgetgadgets and they charged me less then 12 dollars. And so I got myself this cable. And today it arrived in the mail. OK no fancy boxes just a small envelope with a well protected cable inside but do I really need all that packaging? This cable has some nice plugs for audio and video all made out of metal and there is an USB plug to make it possible to charge your iPod / iPhone while watching a a movie. Besides to tell you how nice it is to watch your video on TV there is not much more to say about this cable. It let me turn of the screen of my iPhone 3G when the movie is playing on the TV and that of course will save me power. I could find only one little tiny thing they could have improved and that is the plug that go’s in your iPod there is no marking on it to tell you what way to put it in. For me this means that I will mark it later today but it would have bin nice if they did that for me. Also the wires are the perfect length not to short and not to long either. 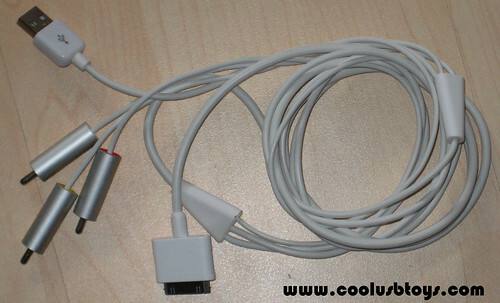 So let me tell you this if you like the idea to watch movies on TV through your iPod / iPhone then go visit Budgetgadgets and order a cable today. They ship it all over the world for FREE. update June 17, 2009. Apple’s new software for the iPhone makes this cable to stop working! So when you get version 3.0 on your iPhone it will not work any more. It worked for me once but that seemed to be pure luck. Of course I keep my eye out for a cheap cable that works.